Warren Benson Pride Jr. is the son of Warren Benson Pride and Ione Walter. Hugo Paul Jacob Suenram was born on 5 December 1900 at NE. He married Stella Francis Pride, daughter of James Benson Pride and Sarah Matilda Howard, on 15 March 1923 at Edmond, OK.. He died on 25 October 1992 at Edmond, OK., at age 91. Merle Hugo Suenram is the son of Hugo Paul Jacob Suenram and Stella Francis Pride. Frances Marie Suenram is the daughter of Hugo Paul Jacob Suenram and Stella Francis Pride. Ray Eugene Suenram is the son of Hugo Paul Jacob Suenram and Stella Francis Pride. Matthew Hickman is the son of Charles Harry Hickman and Myra (---). Ashley Hickman is the daughter of Charles Harry Hickman and Myra (---). Betty Gaye Hickman is the daughter of Charles Henry "Hick" Hickman and Billie Bob McConal. Thomas Hickman was born circa 1790 at England. He married Mary (---) circa 1815. He was listed in the tax lists in 1817 and 1820 at German Twp, Fayette Co, PA.. He died in 1820 at Fayette Co, PA..
Mary (---) was born in 1783 at PA. She married Thomas Bartlett circa 1798 at Caroline, MD.. She married Thomas Hickman circa 1815. She was listed as a widow in the tax lists from 1823 to 1825 at German Twp, Fayette Co, PA.. She migrated to Guernsey Co, OH. circa 1828. She married John Dunaway in 1829. She died after 1870 at Millersburg, Iowa Co, IA..
[S3571] 1860 Iowa Co, IA. Census, Millersburgh. [S4535] 1840 Guernsey Co, OH. Census, Washington Twp. [S2146] Fayette Co, PA. tax lists ,German Twp, 1823, 1824, 1825. [S4819] 1870 Iowa Co, IA. Census, Millersburg. [S4199] 1856 IA State Census, English Twp "Dunaby." [S4822] Pleasant Hill Methodist Church, Washington Twp, Guernsey Co, OH. ,b. 1783, joined 1836, left April 1842. John Jeffrey Hickman was born on 18 February 1818 at German Twp, Fayette Co, PA.. He was the son of Thomas Hickman and Mary (---). He migrated to Guernsey Co, OH. circa 1828. He married Eliizabeth McKinney on 27 November 1841 at Guernsey Co, OH..14 He migrated to Iowa circa 1850. He moved to the Dakota Territory in 1884. He died on 30 July 1902 at Leola, McPherson Co, SD., at age 84. [S3570] 1850 Morgan Co, OH. Census. [S3573] History of Iowa County, Iowa. [S3574] Morreen Hansen, e-mail to Howard Hickman, Oct 2011, photograph. [S2146] Fayette Co, PA. tax lists ,German Twp, 1824, Chidren list: John Hickman, age 6. [S4820] 1880 Iowa Co, IA. Census, English Twp. [S4821] 1900 McPherson Co, SD. Census, Leola. [S1088] Obituary ,McPherson Herald, 1902. [S4828] 1851 IA Cesnsus, Washington Co.
[S4829] 1852 IA Cesnsus, Iowa Co, English Twp. 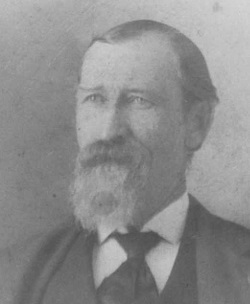 James H. Hickman married Abiigail "Abby" P Littlefield. He was born circa 1816 at German Twp, Fayette Co, PA.. He was the son of Thomas Hickman and Mary (---). He obtained 2 parces of 40 acres, which was sold to Isaac Bartlett from 1854 to 1855 at Iowa Co, IA.. He was a carpenter. [S2146] Fayette Co, PA. tax lists ,German Twp, 1824, Chidren list: James Hckman, age 8. [S4822] Pleasant Hill Methodist Church, Washington Twp, Guernsey Co, OH. ,joined August 1834, left April 1842. [S4199] 1856 IA State Census, Davenport. [S4823] 1880 Marion Co, MO. Census, Hannibal. [S4824] 1860 Marion Co, MO. Census, Hannibal. [S4825] 1854 Scott Co, IA. Census, Davenport. [S4826] 1870 Marion Co, MO. Census, Hannibal. [S4186] Civil War Draft Registration ,Hannibal, MO. [S4827] Hannibal, MO. Directory ,1866, 1871, 1873, 1875, 1879, 1881. Thomas Bartlett was born circa 1775. He married Mary (---) circa 1798 at Caroline, MD.. He died circa 1806 at Fayette Co, PA..
[S2125] 1800 Fayette Co, PA. Census, Georges Twp. [S2222] 1790 Fayette Co, PA. Census, Union Twp. [S1913] 1798 PA Direct Tax List ,Fayette Co, Georges Twp. [S2187] Fayette Co, PA. Orphan Court Record ,Book 1, pp 67, 114, 183, 191, 195,. Issac Bartlett was born circa 1800 at German Twp, Fayette Co, PA.. He was the son of Thomas Bartlett and Mary (---). He married Sarah (---). He died in 1830 at Fayette Co, PA..
[S3295] 1820 Fayette Co, PA. Census. [S2187] Fayette Co, PA. Orphan Court Record ,Book 3 p. 191; Book 5, p. 96, p243. Rachel Bartlett was born on 30 March 1806 at German Twp, Fayette Co, PA.. She was the daughter of Thomas Bartlett and Mary (---). She married Moses W. Dulaney on 22 March 1826 at PA. She died on 4 November 1838 at PA. at age 32. Jane Bartlett married Daniel Dulaney. She was born in 1799. She was the daughter of Thomas Bartlett and Mary (---). Sarah Bartlett was born circa 1804. She was the daughter of Thomas Bartlett and Mary (---). John Dunaway married Mary (---) in 1829. He died in 1830 at Washington Twp, Guernsey Co, OH..
Cindi Ellsworth is the daughter of Lewis Boyd Ellsworth. [S3972] Cindi McLeod, e-mail to Howard Hickman, Feb 2014.